He’s an obstetrician, she’s a housewife. The Boyers, a happy family until fate intervenes and she becomes a household name in a soap advert. So before I launch into my post, yes that is wee Gretl Von Trapp (aka Kym Karath) from The Sound of Music (1965) as Doris Day’s screen daughter Maggie. Now we’ve got that out the way on with the post. I watched this as I wanted to avoid watching yet another actor’s character inevitably winning Doris Day’s heart over lovely Gig Young, So a rewatch of That Touch of Mink (1962) was out the question. Just in case Cary Grant got the gal. This as I’m still upset that Sinatra’s surly character Barney won her in Young at Heart (1954). And I’m equally annoyed that Young also lost Doris to Clark Gable, in Teacher’s Pet (1958). But I stress, this upset is with the characters, not the actors. So looking at Day’s vast list of leading men from back then I plonked for her with James Garner as her screen husband in The Thrill of It All (1962). Garner an actor I’ve always enjoyed watching, even if I didn’t enjoy the actual film. See The Notebook (2004) review HERE. Which was only watched as Garner in it. This actor always dashingly handsome and charismatic, be it in The Rockford Files (1974-81) , The Great Escape (1961) or one of his many Bret Maverick (1981-82) TV reincarnations. In a turtleneck, suit, scrubs or tuxedo, he’s the source of many a reel infatuation. Day of course I’ve loved in many of those Battle of the Sexes films that inspired the likes of Moonlighting (1985-89) and Down With Love (2003). The Thrill of It All starts with a middle-aged woman, Mrs. Fraleigh (Arlene Francis) looking superexcited, (what about we’re not sure). She is dancing and smiling at anyone and everyone. She then – after about what seemed like (at least) 5 minutes screen time – visits her similarly aged (if not more) husband, Mr. Fraleigh (Edward Andrews) at work. Proclaiming she’s pregnant. If it hadn’t been for this film’s opening credits featuring Day, I would have thought I was watching the wrong film. Also in a side note, Day didn’t (to my surprise) sing the opening credits. Anyway. the Fraleighs are so happy and overwhelmed (they’ve been trying to conceive for 20 years), they invite her obstetrician, Dr Gerry Boyer (James Garner) and his wife, Beverly (Doris Day) to dinner. Gerry calls Beverly at home. She’s bathing daughter Gretl Maggie., so the message comes (after some time) via their young son, Andy (Brian Nash). Maggie complains about the smell of the soap used to wash her hair, so Beverly uses a bar of Happy Soap. With her daughter now more than happy to smell like her music teacher. (And this soap brand not mentioned as one of Gretl’s favourite things in that Julie Andrews musical as an in-joke). The Boyers arrive at the Fraleighs for dinner. It’s all quiet at the dinner table, with Mr Fraleigh’s elderly and gruff sounding, father Tom (Reginald Owen) watching his soap sponsored TV show. He’s the man whose factory manufactures Happy Soap, with an advert for this soap showing in the commercial break. Featuring a young blonde thing in the bath extolling the joys of said soap 1960s style. With all the male advertising executives present heartily approving of this girl advert, and this including happily married, Gerry. With Gerry craning his neck trying to see more than is suggested on-screen. As your partner may have done with Margot Robbie, in that scene from The Wolf of Wall Street (2013). Beverly tells the dinner party chirpily about her amusing experience with Maggie and the soap, in her own bubbly and unique way. Her true story – honestly and affectionately told – stops the old codger in his tracks. Then and there, he invites Beverly to be his new Happy Girl and advertise the soap on TV adoring her frank, honest approach. Beverly and Gerry turn this offer down, with her happy being a doctors wife and mother. However the next day one of Tom’s minions. Mike Palmer (Elliott Reid) is dispatched to convince Beverly to take the job with a ridiculous pay offer of 80,000 dollars (which is a stupidly insane amount of money now) for weekly promotions. Beverly accepts this offer and this job leading to stardom and all that goes with it. However with increasing demands on her time, Beverly and Gerry rarely spend time together, she’s more of the breadwinner than him. She also has less time with their kids, Maggie and Andy. Gerry often has to care for them himself – when the housekeeper off duty – and juggle his working life round hers. Beverly’s sudden rise to fame putting her marriage at risk, with the repercussions from one huge fight leading to him leaving her. As Gerry’s not exactly thrilled by it all… and if you want to know what happens next, tune into this movie. This is very much a Battle of the Sexes film, and it seems more of a throw back to those Doris Day 1950s films. This film with her balancing a career and a family, Day easily showing those wonderful contrasting roles. As a warm, fun mum and loved up wife, and as a career driven woman with a heart. It was hard to believe this as a 1960s film, particularly as the Cold War drama The Manchurian Candidate (1962) came out the year before (with Day’s screen partner Frank Sinatra). And The Innocents (1961) was two years before. However, it does feel like very much a Doris Day movie, even if this intended initially for Judy Holliday. Garner and Day have a wonderful on-screen chemistry. With this screen pairing delightful to watch, it is hard not to notice this talented pair’s professional affection for each other. Garner and Day made a credible couple in all their scenes, with them both bringing out the best in each other. In their romantic, dramatic or comic scenes or those scenes where they were at loggerheads, you always feel their strong on-screen rapport. This in their natural performances showing love, frustration and exasperation as required by the script. Both sharing the limelight and bringing out their strengths, they shine and dazzle as a screen couple. It was a refreshing change seeing Day in a non singing role, and the plot to my relief didn’t make her singing talents part of this storyline or the credits. If for example she had sung a jingle for this soap advert, rather than spoke about it. This would have detracted from the essence of the story, which I see as one of a housewife’s love for her husband, family and happiness. Day was believable in those scenes featuring her novice role in advertising, particularly in her first advert. Where her housewife’s natural nervousness was seen in this her first performance behind the camera. Fluffing her lines and saying the wrong words made her honest, endearing and likable. These attributes shown in Doris Day’s performance made her perfect for this part of a housewife in an acting role. and he of her, HERE. And Doris was a joy to work with. Everything she did seemed effortless. She’s so sweet and so professional – she made everyone around her look good. She put me completely at ease and made me feel safe. It made it very easy to pretend that she was my mother. The support is wonderfully comic and fun with the Fraleigh family cast giving a small but important part to proceedings. Their roles adding to the more amusing moments of the film particularly at the start and end of the movie. The timing of these appearances a nice touch, with the Fraleighs storyline not detracting from that of the Boyer family. There’s something in this film for everyone. There’s on-screen romantic scenes with Garner and Day, some well set up comic scenes (one delivered by Garner is fantastic to watch, even if you feel you know the pay off) and a sly look at advertising techniques of the day. With scenes looking at the spoken television advert as seen behind the scenes with executives watching both Black and White and colour screens, a billboard attracting Gerry’s attention (with more comic results) to Beverly posing with a soap bar for promotional photographs. The script surrounding these shown in a fun, yet I imagine true to life manner. So next on the Doris Day to watch list, will be a look at this acting pair’s second movie together, also released in this year. With Move Over Darling (1963). But then with a lovely on-screen chemistry this will I be disappointed if like Gig Young, Garner’s character loses Day. As here, in The Thrill of It All, it’s as clear as Day. 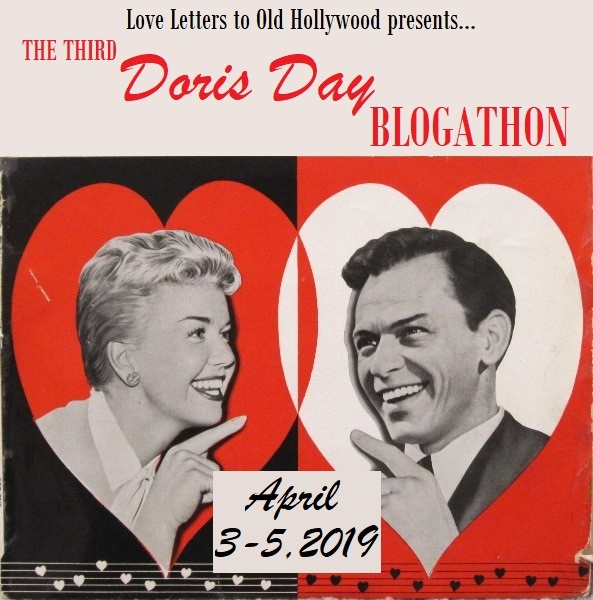 This post was added to Love Letters to Old Hollywoods 3rd Annual Doris Day blogathon. Other posts with this cast include Doris Day in With Six you Get Eggroll, My Golden Hollywood Greats, Teachers Pet and Young at Heart. Kym Karath stars in my The Sound of Music review and a post about the House that this film was filmed in. James Garner starred in The Notebook and Brian Nash in Bewitched. This is one of my favorite favorite Doris day movies- It was the first Doris movie I ever saw so its special to me for sure! When my Mom and I watched it it had been many years since she saw it last- but very quickly remembered how awesome it was! I love the whole (vintage) advertising methods that we get to see in this film! AND THE Impala in the pool- priceless!!! I’d forgotten just how wonderful Doris Day is when paired with James Garner. They are fantastic. It was a nice wee surprise to see Kym Karath in an early role before the Sound of Music. So glad you enjoyed this film! Day and Garner were indeed a formidable pair. It’s a shame their films together aren’t super well-known, but that doesn’t make them any less delightful! Thanks for having me, was great to revisit this movie. Remembered seeing it as a kid with the soap suds scenes. Bravo, Gill,for a really great take on a movie of which I am very fond. As a stay-at-home mother myself, I’ve often been intrigued by films with similar characters. Like you said, Doris brought a lot of realism to the role although I must say that I never looked that good with two young children! 🙂 And James Garner was so adorable, also looking mighty fine in his pyjamas. Some people may find this film to be a little outdated with social norms (her giving it all up in the end to have a third child) but I think it’s a nice, heartfelt story. Thanks Poppity, likewise adored your post on Young at Heart, that has always been my favourite of hers. I love the James Garner and Doris Day pairing. They are completely believable as an on-screen couple, and they both have great comedic timing. This film always makes me laugh…and it’s a wonderful love story too. They are lovely film pairing, going to have to check out Move Over Darling now. Great write up on a very cute movie…Garner was as engaging a costar as Rock Hudson for Doris, in my opinion. I just watched Move Over Darling on TCM the other night and I think you will enjoy! A very cute movie. Certainly not as scathing a look at advertising as Lover Come Back, but a pleasant time capsule. Talented people involved on and off screen. Such a treat to see so many familiar faces. I was surprised to read that Reiner had planned this for Judy Holiday initially, but I can definitely picture her in the role. It is grand however that we have the treat of Doris Day and James Garner together. They are lovely together, I’d even forgive Garner’s character if he won her over Gig Young. He’s such a lovely charismatic actor – will have to check out more of his films. Somehow as a kid I didnt connect him as being the same actor behind Jim Rockford in The Rockford Files.